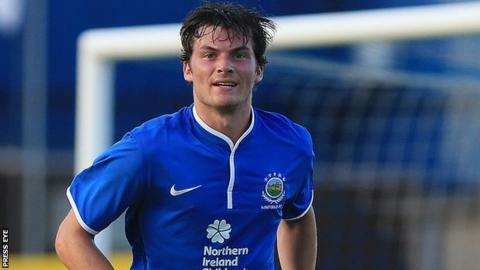 Title hopefuls Linfield welcome back midfielder Philip Lowry and defender Sean Ward for Saturday's Irish Premiership match away to Crusaders. The suspended duo were badly missed by the Blues in their 3-1 defeat at home to champions Cliftonville who replaced them at the top of the league table. Cliftonville are one point ahead of David Jeffrey's men with four matches left in the race for the Gibson Cup. They are at home to sixth-placed Glentoran on Saturday. Reds' manager Tommy Breslin must again plan without influential captain George McMullan, who remains sidelined with a foot tendon injury sustained in the 0-0 draw with Glentoran three weeks ago. The Glens are without Jay Magee, Jim O'Hanlon, David Scullion, Marcus Kane, David Howland and Curtis Allen for the testing trip to Solitude. Glens boss Eddie Patterson also has doubts over Elliott Morris, Calum Birney and Willie Garrett for the clash with the champions. Linfield will be up against a Crusaders team with just their league placing to play for after being knocked out of the Irish Cup by Glenavon in last weekend's semi-final. Crusaders need to hold on to third place to secure another appearance in the Europa League and they are currently five points better off than Portadown in fourth. "Stephen and his players will look back on several opportunities that they had to beat Glenavon," said Linfield manager Jeffrey. "I have no doubt that Crusaders will redouble their efforts. They are pushing for European football and we know how tough a venue Seaview has been for us in recent times." The Crues are still missing Aidan Watson because of a back injury, while long-term casualties Declan Caddell and Matthew Snoddy are sidelined and unlikely to feature again this season. Glenavon go into the Mid-Ulster derby against Portadown buoyed by the news that a string of key players have signed new contracts. Defenders Gareth McKeown, Rhys Marshall and James Singleton, goalkeeper James McGrath and midfielder Andy McGrory will all be remaining at Mourneview Park. Ports midfielder Neil McCafferty starts a two-match suspension, while Tim Mouncey is also rated doubtful with a knee injury. In the bottom half of the table, Coleraine are at home to derby rivals Ballymena United and Dungannon Swifts entertain Warrenpoint Town. Stephen Lowry and Gary Browne are suspended for the Bannsiders, while Ballymena duo Jim Ervin and Tony Kane are also serving bans. Aaron Stewart, Johnny Taylor and Gary Thompson are all injured, while Darren Boyce is not available and David Cushley is doubtful, having not trained all week.